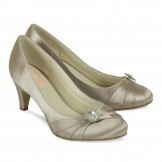 You can shop by heel height, colour and narrow your search to just vintage Bridal shoes too. 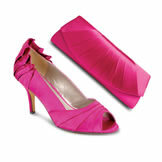 With such an extensive selection you'll find the pair that suits you best. After you find the style for you then you can select a colour that suits your dress e.g. 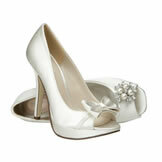 an ivory dress with ivory bridal shoes. If you want to be daring with colour we can dye your shoes for you. Rainbow Club wedding shoes allow you to dye your shoes before or after the wedding meaning you could get more use from them after the big day. Even vintage wedding shoe styles can be dyed. Some styles are available in extra small and larger sizes as well as in wide fit so you're comfortable in your shoes all day long. Experts in getting the colour right, the dyeing of ivory satin bridal shoes to any colour is an integral part of The Wedding Boutique ensuring complete satisfaction when matching up your accessories, but the choice is yours. 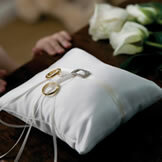 As with our wedding dresses we also work with designers to supply beautiful bridesmaid dresses. Creations by Gino Cerruti and Linzi Jay, Prom Frocks will ensure your bridesmaids look beautiful and feel comfortable. We are also stockists of prom, cocktail and ball gowns. 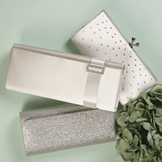 With a dedicated Room, we can give you the time and make sure that you are totally accessorised for the occasion. Come in to the boutique for a fitting and we will also ensure no one else at your event is wearing the same dress.